Some of the most eloquent speeches made during the Second Seminole War are recorded by Captain John T. Sprague in 1841, in his book "The Origin, Progress and Conclusion of the Florida War." 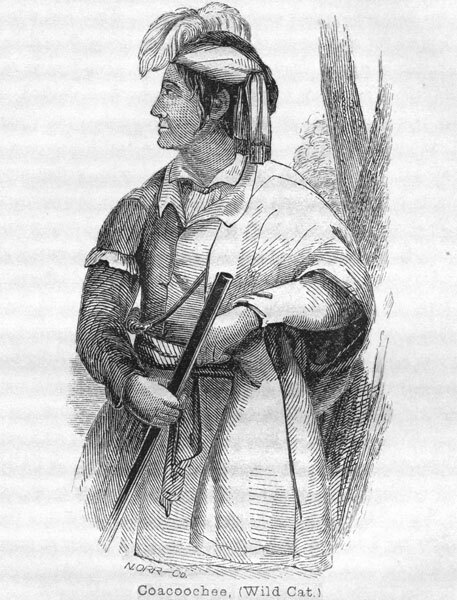 Coacoochee, also known as Wildcat, was Miccosukee and one of the most resistant war leaders during the war. (He is often referred to as Seminole, but it is more correct to call him Miccosukee. During that time, most all of the Florida Indians were called Seminoles.) He had made a daring escape from Fort Marion, the former Spanish fortress in St. Augustine, in November 1837, and continued the Seminole resistance to remain in Florida. In 1841 he was finally captured and put in chains. He was forced to send a message to his people to come in and surrender, or he would be hanged. During this series of "peace talks," are recorded some of the most emotional speeches that we have of this war. Let us start after Col. Worth had finished speaking to a Seminole / Miccosukee delegation. This speech is found on pages 288-292 of Sprague's book, as well as in, "Coacoochee, Made of the Sands of Florida," by Arthur E. Francke, Jr. This talk took place, ironically, on July 4th, 1841, and means the end of independence for these brave warriors. Grammar and punctuation are the same as in the original book, published in 1848. "I was once a boy, " said he, in a subdued tone, "then I saw the White man afar off. I hunted in these woods, first with a bow and arrow; then with a rifle. I saw the white man, and was told he was my enemy. I could not shoot him as I would a wolf or a bear; yet like these he came upon me; horses, cattle, and fields, he took from me. He said he was my friend; he abused our women and children, and told us to go from the land. Still he gave me his hand in friendship; we took it; whilst taking it, he had a snake in the other; his tongue was forked; he lied, and stung us. I asked but for a small piece of these lands, enough to plant and to live upon, far south, a spot where I could place the ashes of my kindred, as spot only sufficient upon which I could lay my wife and child. This was not granted me. I was put in prison; I escaped. I have been again taken; you have brought me back; I am here; I feel the irons in my heart. I have listened to your talk; you and your officers have taken us by the hand in friendship. I thank you for bringing me back; I can now see my warriors, my women and children; the Great Spirit thanks you; the heart of the poor Indian thanks you. We know but little; we have no books which tell all things; but we have the Great Spirit, moon, and stars; these told me, last night, you would be our friend. I gave you my word; it is the word of a warrior, a chief, a brave, it is the word of Coacoochee. It is true I have fought like a man, so have my warriors; but the whites are too strong for us. I wish now to have my band around me and go to Arkansas. You say I must end the war! Look at these irons! Can I go to my warriors? Coacoochee chained! No; do not ask me to see them. I never wish to tread upon my land unless I am free. If I can go to them unchained, they will follow me in; but I fear they will not obey me when I talk to them in irons. They will say my heart is weak, I am afraid. Could I go free, they will surrender and emigrate." The commander, [Col. Worth] in reply, told him, with firmness and without disguise, that he could not go, nor would his irons be taken off until his entire band had surrendered; but that he might select three or five of the prisoners, who should be liberated, and permitted to carry his talk; they should be granted thirty, forty, or fifty days, if necessary. Worth said, "I say to you again, and for the last time, that unless the band acquiesce promptly with your wishes, to your last wish, the sun, as it goes down on the last day appointed for their appearance, will shine upon the bodies of each of you hanging in the wind." "This injunction was given in such a manner as to impress the prisoners with the firm belief that it would be literally fulfilled. It was manifest in the convulsive expression of their stern and rugged faces. To escape, was beyond all hope. 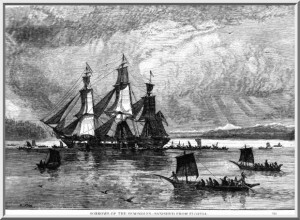 The vessel lay moored in deep water, two miles from shore. Firmly ironed, and surrounded night and day be sentinels, their fate was inevitable; and as the reality rose upon them they were sad and depressed. Here was a chief, a man whose only offense was defending his home, his fireside, the graves of kindred, stipulating, on the Fourth of July, for his freedom and his life." An incident occurred, when Coacoochee was most excited, which carried forcibly to the minds of all present the import of the day, and impressed in a manner not to be forgotten, the scene in which all were participating. A government schooner lay moored in the immediate neighborhood; at 12 Noon., as is customary, she opened [fired] her batteries. Coacoochee, hearing the repeated discharge, and seeing the interest manifested, ceased speaking, and asked, "What is that for?" Again he inquired, but silence was the only response. The Indian instinctively seemed to think it the jubilee of freedom. Well might the white man deny the natal day of his country. That flag, waving from the masthead of Coacoochee's prison-ship, symbolical of freedom, was saluted by the roar of artillery, announcing to the world the liberty of twenty millions of people, free, independent, intelligent, and happy. "Has not Coacooche," he said, "sat with you by the council-fire at midnight, when the wolf and white man were around us? Have I not led the war dance, and sung the song of the Seminole? Did not the spirits of our mothers, our wives, and our children stand around us? Has not my scalping-knife been red with blood, and the scalps of our enemy been drying in our camps? Have I not made the warpath red with blood, and has not the Seminole always found a home in my camp? Then, will the warriors of Coacooche desert him? No! If your hearts are bad, let me see them now; take them in your hands, and let me know they are dark with bad blood; but do not, like a dog, bite me, so soon as you turn your backs. If Coacoochee is to die, he can die like a man. It is not my heart that shakes; no, it never trembles; but I feel for those now in the woods, pursued night and day by the soldiers; for those who fought with us, until we were weak. The sun shines bright to day, the day is clear; so let your hearts be: the Great Spirit will guide you. At night, when you camp, take these pipes and tobacco, build a fire when the moon is up and bright, dance around it, then let the fire go out, and just before the break of day, when the deer sleeps, and the moon whispers to the dead, you will hear the voices of those who have gone to the Great Spirit; they will give you strong hearts and head to carry the talk of Coacoochee. Say to my band that my feet are chained. I cannot walk, yet I send them my word as true from the heart, as if I as on the warpath or in the deer-hunt. I am not a boy; Coacoochee can die, not with a shivering hand, but as when grasping the rifle with my warriors around me." "My feet are chained, but the head and heart of Coacoochee reaches you. The great white chief (Po-car-ger) will be kind to us. He Says, when my band comes in I shall again walk my land free, with my band around me. He has given you forty days to do this business in; if you want more, say so; I will ask for more; if not, be true to the time. Take these sticks; here are thirty-nine, one for each day; this, much larger than the rest, with blood upon it, is the fortieth. When the others are thrown away, and this only remains, say to my people, that with the setting sun Coacoochee hangs like a dog, with none but the white men to hear his last words. Come then; come by the stars, as I have led you to battle! Come, for the voice of Coacoochee speaks to you!" "Say this to my wife and child --"
"Give these," said he, "to my wife and child." Picture: "Sorrow of the Seminoles" as they are removed from their homes, by John T. Sprague. Coacoochee and his band were taken into exile to the western Indian Territory. Had he remained in Florida, he would have been hereditary chief after Micanopy. After many hardships, Coacoochee led his people and many of the Black Seminoles to freedom in Mexico in 1850, where he received an appointment as a Colonel in the Mexican Army. He died in 1857 of small pox; free but still exiled from Florida.